The single-chamber ICD results from the PainFree SST trial were published January 27, 20151, continuing the Medtronic legacy of investigation in shock reduction technology. 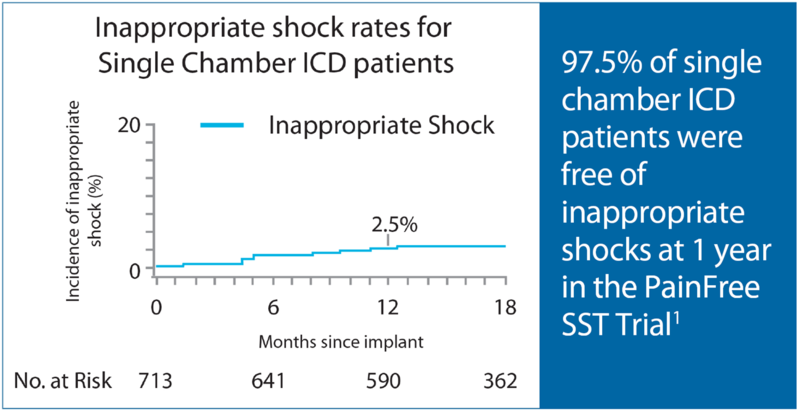 PainFree SST is the only large shock-reduction trial to report inappropriate shock rates for single-chamber ICD patients. SmartShock™ Technology was tested in a real-world population and was shown to reduce inappropriate shocks in single-chamber and AF patients, for whom discrimination is more challenging. Listen to Medtronic Scientist James Coles, PhD, explain the real-world performance of rhythm discrimination algorithms in single-chamber ICD patients in the video at right. 1 Auricchio A, Schloss EJ, Kurita T, et al. Low inappropriate shock rates in patients with single and dual/triple chamber ICDs using a novel suite of detection algorithms: PainFree SST Trial Primary Results. Heart Rhythm. 2015; 12(5): 926-936. 2 Moss AJ, Schuger C, Beck CA, et al. Reduction in inappropriate therapy and mortality through ICD programming. N Engl J Med. December 13, 2012;367(24):2275-2283. 3 Saeed M, Hanna I, Robotis D, et al. Programming implantable cardioverter-defibrillators in patients with primary prevention indication to prolong time to first shock: results from the PROVIDE study. J Cardiovasc Electrophysiol. January 2014;25(1):52-59. 4 Wathen MS, DeGroot PJ, Sweeney MO, et al, for the PainFREE Rx II Investigators. Prospective randomized multicenter trial of empirical antitachycardia pacing versus shocks for spontaneous rapid ventricular tachycardia in patients with implantable cardioverter-defibrillators: Pacing Fast Ventricular Tachycardia Reduces Shock Therapies (PainFREE Rx II) trial results. Circulation. October 26, 2004;110(17):2591-2596. 5 Sweeney MO, Sherfesee L, DeGroot PJ, Wathen MS, Wilkoff BL. Differences in effects of electrical therapy type for ventricular arrhythmias on mortality in implantable cardioverter-defibrillator patients. Heart Rhythm. March 2010;7(3):353-360. 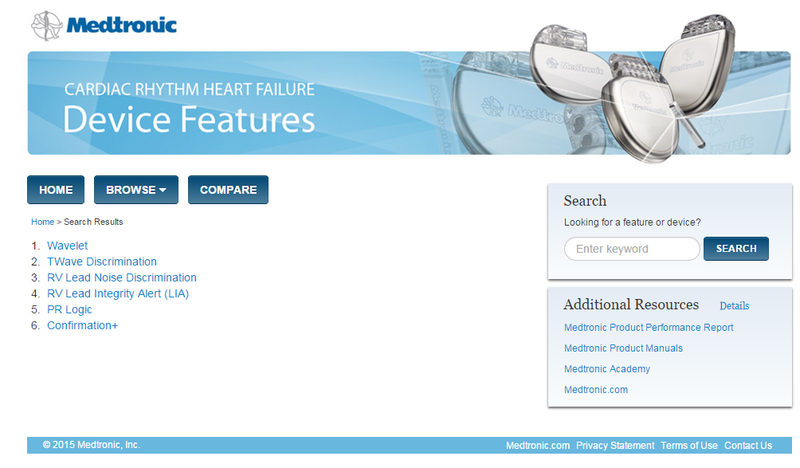 This webpage is intended only for users in markets where Medtronic products and therapies are approved or available for use as indicated within the respective product manuals. Content on specific Medtronic products and therapies is not intended for users in markets that do not have authorization for use. In this video, Medtronic Scientist, James Coles, PhD, provides an overview of the PainFREE SST clinical trial objectives and results as well as background on inappropriate shocks. Click here to access more information and download the video. Access Dr. Cole's History of Shock Reduction video to learn more about the importance of avoiding shocks and the strategies for reducing inappropriate or unnecessary shocks in device patients. Also refer to Dr. Edward Schloss's video about the initial PainFREE SST results for dual- and triple-chamber ICDs from 2013. *Note: Products and therapies referenced on Medtronic Device Features as well as the materials available for viewing and download on that site are based on US approved products and conditions of use. 1 Schloss EJ, Auricchio A, Kurita T, et al. PainFree SST Trial Primary Results: Low Shock Rates in Patients with Dual and Triple Chamber ICDs Using Novel Detection Algorithms. Heart Rhythm. 2013;10(5):S64. 2 Protecta Clinical Study, Medtronic data on file. Implantable cardioverter defibrillators (ICDs) are indicated for ventricular antitachycardia pacing and ventricular defibrillation for automated treatment of life-threatening ventricular arrhythmias. Some ICDs are also indicated for use in patients with atrial tachyarrhythmias, or those patients who are at significant risk for developing atrial tachyarrhythmias. The RV Lead Integrity Alert (LIA) feature is intended primarily for patients who have a Medtronic ICD or CRT-D device and a Sprint Fidelis lead (Models 6949, 6948, 6931, and 6930, based on performance data. The RV LIA feature may not perform as well with a St. Jude Riata/Durata lead or a Boston Scientific Endotak lead as it does when used with a Medtronic Sprint Fidelis lead. This is because different lead designs may have different failure signatures and conditions that may or may not be detected early by the RV LIA feature. Notes for ICDs: The ICD features of the device functions the same as other approved Medtronic market-released ICDs. Due to the addition of the OptiVol diagnostic feature, the device indications are limited to the NYHA functional class II/III heart failure patients who are indicated for an ICD. The clinical value of the OptiVol fluid monitoring diagnostic feature has not been assessed in those patients who do not have fluid retention related symptoms due to heart failure. Additional notes for DR ICDs: The use of the device has not been demonstrated to decrease the morbidity related to atrial tachyarrhythmias. The effectiveness of high-frequency burst pacing (atrial 50 Hz Burst therapy) in terminating device classified atrial tachycardia (AT) was found to be 17%, and in terminating device classified atrial fibrillation (AF) was found to be 16.8%, in the VT/AT patient population studied. The effectiveness of high-frequency burst pacing (atrial 50 Hz Burst therapy) in terminating device classified atrial tachycardia (AT) was found to be 11.7%, and in terminating device classified atrial fibrillation (AF) was found to be 18.2% in the AF-only patient population studied. Cardiac Resynchronization Therapy (CRT) ICDs are indicated for ventricular antitachycardia pacing and ventricular defibrillation for automated treatment of life-threatening ventricular arrhythmias and for providing cardiac resynchronization therapy in heart failure patients who remain symptomatic despite optimal medical therapy if indicated, and meet any of the following classifications: New York Heart Association (NYHA) Functional Class III or IV and who have a left ventricular ejection fraction ≤ 35% and a prolonged QRS duration. Left bundle branch block (LBBB) with a QRS duration ≤ 130 ms, left ventricular ejection fraction ≤ 30%, and NYHA Functional Class II. NYHA Functional Class I, II, or III and who have left ventricular ejection fraction ≤ 50% and atrioventricular block (AV block) who are expected to require a high percentage of ventricular pacing that cannot be managed with algorithms to minimize right ventricular pacing. Optimization of heart failure medical therapy that is limited due to AV block or the urgent need for pacing should be done post-implant. Some CRT ICDs are also indicated for use in patients with atrial tachyarrhythmias, or those patients who are at significant risk for developing atrial tachyarrhythmias. The RV Lead Integrity Alert (LIA) feature is intended primarily for patients who have a Medtronic ICD or CRT-D device and a Sprint Fidelis lead (Models 6949, 6948, 6931, and 6930) based on performance data. The RV LIA feature may not perform as well with a St. Jude Medical RiataTM/Durata® lead or a Boston Scientific Endotak lead as it does when used with a Medtronic Sprint Fidelis lead. This is because different lead designs may have different failure signatures and conditions that may or may not be detected early by the RV LIA feature. ICDs are contraindicated in patients experiencing tachyarrhythmias with transient or reversible causes including, but not limited to, the following: acute myocardial infarction, drug intoxication, drowning, electric shock, electrolyte imbalance, hypoxia, or sepsis; patients who have a unipolar pacemaker implanted, patients with incessant ventricular tachycardia (VT) or ventricular fibrillation (VF), and patients whose primary disorder is chronic atrial tachyarrhythmia with no concomitant VT or VF. Changes in a patient's disease and/or medications may alter the efficacy of the device's programmed parameters. Patients should avoid sources of magnetic and electromagnetic radiation to avoid possible underdetection, inappropriate sensing and/or therapy delivery, tissue damage, induction of an arrhythmia, device electrical reset or device damage. Do not place transthoracic defibrillation paddles directly over the device. Additionally, for CRT ICDs and CRT IPGs, certain programming and device operations may not provide cardiac resynchronization. Also for CRT IPGs, Elective Replacement Indicator (ERI) results in the device switching to VVI pacing at 65 ppm. In this mode, patients may experience loss of cardiac resynchronization therapy and/or loss of AV synchrony. For this reason, the device should be replaced prior to ERI being set. Use of the device should not change the application of established anticoagulation protocols.